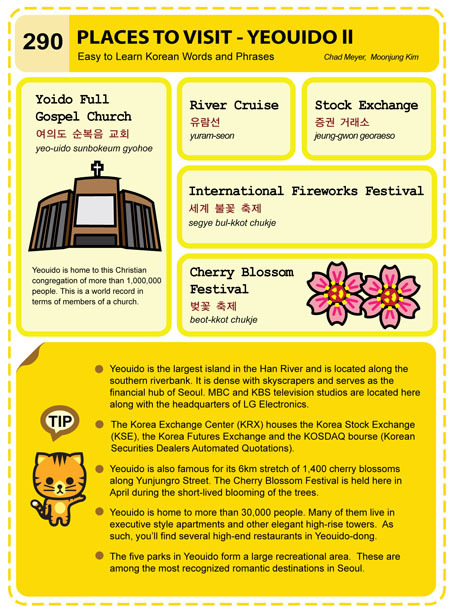 This weekend kicked off the annual cherry blossom/spring festival at Seoul’s Yeouido (Yeoui Island). There are over 1400 cherry blossom trees there. Visit the KTO website for more information. Official festival website (Korean only). This entry was posted in Series and tagged Bam Island, Building 63, cherry blossom, cherry blossom festival, ferry cruise tickets, Han River, International Fireworks Festival, KOSDAQ, KRX, National Assembly building, pier, river cruise, Seoul, stock exchange, Yeouido, Yeouido Ferry Terminal, Yeouido Full Gospel Church, Yeouido Park by easykorean. Bookmark the permalink.